Warwick District Council’s planned new headquarters could include shops on the ground floor. 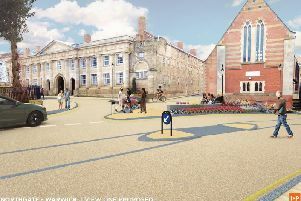 The council’s executive decided last week to press on with plans to build the offices at the site of the Covent Garden car park between Tavistock Street and Russell Street in Leamington town centre. And Cllr Andrew Mobbs (Con, Kenilworth Park Hill), council leader, said he was in favour of having space available for retail at the building. He added: “We also need to improve the car park and this will allow us to provide better parking facilities at that end of town. “We looked at all the sites and in terms of viability this one stands out as the best. The council has been considering sites for the project since 2012 with various options being considered. In November 2014, it created a shortlist of sites which included land in front of the Royal Spa Centre - the site then preferred by the council. Other sites and options considered and now deemed unsuitable were the Court Street car park, Chandos Street car park and also refurbishing the council’s current offices at Riverside House in Milverton Hill. A report to council said: “An exhaustive search for potential sites led to the production of the ‘longlist’ considered in December 2014 and a further iterative (repeatedly) assessment has now concluded that of the ‘shortlist’ options it is Covent Garden that should be investigated in detail. “It is recommended that the council makes a final decision on a preferred option and discontinues any further assessment work on alternatives, freeing up the resources that have been devoted to the task. Work could begin in 12 months’ time with the offices opening in March 2018. Building the headquarters and replacing the multi-storey car park would cost about £16 million, with the council hoping to make £4.42 million from the sale of its Riverside House site. Steve Tebby, who lives near the proposed site has expressed his concerns in a letter on page 34.